The web-of-life game included in one of the IDiverSE activities (Bees for the Future) seems to be a success among students! 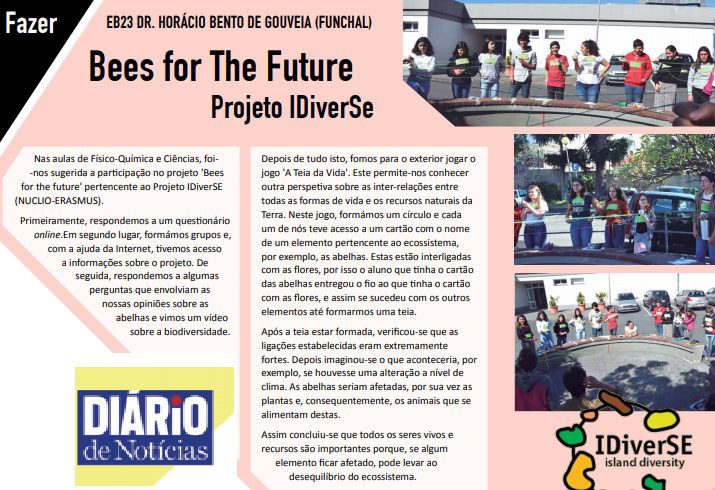 Following their experience, 2 students Margarida Nóbrega and Marta Freitas, from Horácio Bento Gouveia School in Madeira wrote an article that was published in the local magazine: “Diário de Notícias”. In their words “we concluded that all living beings and resources are important because if one element is affected, it can lead to the unbalance of the ecosystem”. The Bees for the Future activity intends to raise awareness among students for the importance of bees in our lives and lead them into creating an awareness campaign for their communities. Bees are not only an integrative part of the ecosystem as they are responsible for over 70% of what we eat. We should preserve them and be aware of our actions towards them.